The surprise of short rib ravioli with tangy horseradish-creme fraiche sauce, dusted with parmesan and fresh cracked pepper. More Slavic than Italian. Absolutely divine. Hats off to chef Amy. It wasn’t hard coming up with the “food I loved” for the new “Fresh from Maine” radio show I launched today with veteran Brunswick food writer and cookbook author Michael S. Sanders. It was a simple, Silver Palate-inspired winter borscht, a velvety broth with beets, tomato and braised cabbage, held together with a meaty short rib broth. Michael served it for lunch as we pulled together the show last week. Hands down best borscht I’ve ever had. It turns out Michael’s discovery of these short ribs discounted at Shaw’s (the large grocery store with the best meat selection) led to not one, but three distinct meals. Talk about frugal gourmet. First, they slow-braised the short ribs in beer, plating the fall-off-the-bone morsels atop polenta. The recipe came from Michael’s lovely Fresh from Maine cookbook, he thought from the Portland restaurant, Vignola Cinque Terre. Or was it the “Stout and Chili Braised Short Ribs over Parmesan Polenta” recipe from the Harraseeket Inn in Freeport? The only expensive thing was the gluten-free beer required for braising to accommodate a guest’s dietary preferences. Meal #1. 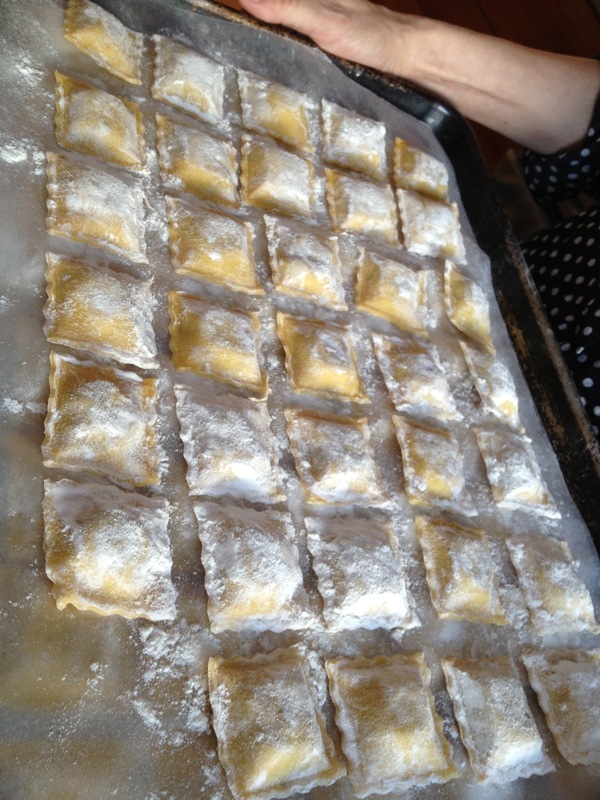 The pressed ravioli, to be boiled and dressed. The braising liquid and bones Michael and his wife, Amy, then boiled down into stock with the requisite veggies. The resulting rich elixir yielded the most delicious borscht. No tough chunks of meat here but more umami-rich and savory than the still-good, vegetarian Moosewood version. Meal #2. And Meal #3 was today to celebrate our first radio show (for now on Sundays at noon…live-stream it!) on WBOR, the Bowdoin College station. Michael and Amy graciously invited us to join them and their neighbors for an impromptu, quite convivial meal embodying the best of the Slow Food ethos. Amy, who is busy as an AP English and creative writing teacher at the high school, still managed to whip up a batch of homemade ravioli, putting the leftover short rib meat to good use. But don’t let the “ravioli” label fool you. These were more Slavic, almost like pirogis or Russian pelmeni, than Italian pasta. No coincidence here, since Michael and Amy speak Russian, and he used to import rugs from there and the Ukraine. A light horseradish-creme fraiche sauce perfectly complemented the sweet short rib meat. 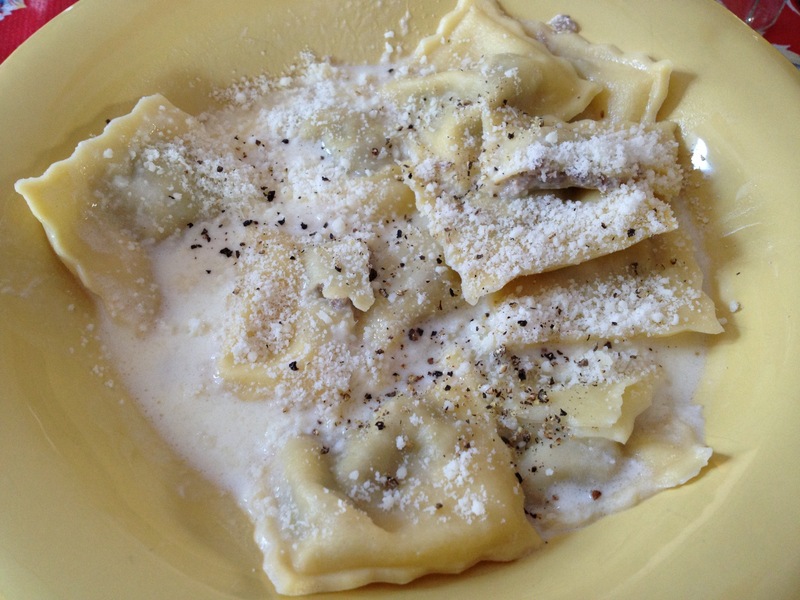 The ravioli reminded me of my Nonny’s kreplach, which I have yet to recreate. Here’s to more short ribs and homemade ravioli (and kreplach) in 2013! Congratulations on starting the radio show, and I’m glad to see you’re actively blogging! I have just subscribed to the blog. I like the idea of horseradish sauce on ravioli.